Over the past few years TPA testing has caused much concern. In general, TPA is a very popular method of testing, and this is considered so as it provides very quick calculation of parameters which are 'believed to correlate with sensory analysis'. The user is almost encouraged to not think about the analysis and in doing so takes down the results as true. One should always consider the parameters before testing and only bear in mind those parameters which are actually applicable to the product. After all, how can the springiness parameters possibly be repeatable for a product such as chocolate; likewise, unless of very special formulation, bread could never be considered to be adhesive, and therefore these results should not be reported. Another area of abuse is the degree of compression. Often when presumably limited by force capacity, we find that results are shown for compression to, for example, 30%. When considering that the analysis of the results were developed to correlate with sensory analysis, one must clearly bear in mind that compression in the mouth is never 'small deformation' (i.e. a gently squeeze) and that the probe/fixture used should always assume the principle of compression (i.e. only flat probes larger than the sample should be used for testing). As a founder of the Texture Profile Analysis (TPA) in the 60's, I am very gratified that the method presently enjoys considerable use and popularity. I am especially pleased that a number of researchers have built on it, as I have hoped they would. Some of this work constitutes indisputable improvements (as e.g., using only the down, i.e. left-hand side, portion of the force-deformation curves to calculate cohesiveness, or a sounder and easier method of quantifying springiness). Other researchers have just expanded the number of quantified parameters by adding new ones (e.g. hardness 2) without demonstrating their usefulness. Alina Surmacka Szczesniak, formerly Principal Scientist, General Foods Technical Center, and founding editor of Journal of Texture Studies. The project can be found in the Exponent Samples directory. You will probably need to modify the Texture Analyser Settings to suit your particular product. TPA32.MAC: this is the macro that issues all of the commands to find and measure the required data from a graph. There may be a need for changes to the TPA macro due to the particular properties of your sample and the forces derived. If the sample has no Fracture peak, then a pop-up box will appear stating Peak Not Found. Click on OK to continue. 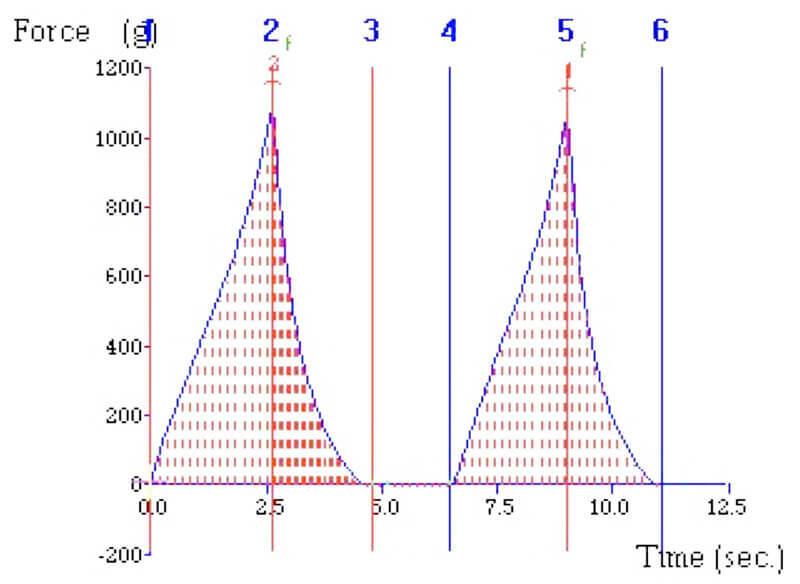 The three force peaks are found in REVERSE order (see graph above) so that a missing fracture peak will still produce the correct values for other results. If the force peaks appear towards the end of the graph, failure to notice this is most likely to cause all TPA values to be incorrectly calculated. In this case, try selecting a larger Force Threshold in your Graph Preferences. After the peaks of the curve are detected the macro then instructs the cursor to search forwards and drop 6 anchors, in order, onto the curve (as shown above). If the message, e.g. 'Unable to place cursor at specified position' is displayed, then it is likely that the Distance Threshold is too high. Again failure to notice this is most likely to cause most of the TPA values to be incorrectly calculated. In this case try selecting a lower Distance Threshold in your Graph Preferences. If the sample has no adhesiveness properties at all, the force might not return to zero between the two compression strokes. If this is the case, then the anchors will not be positioned correctly. To correct this problem, you might need to adjust the Go To Force value in the macro from 0.0 to something greater than the Texture Analyser trigger force. The Adhesiveness result will then show a positive value, which should be ignored. TPA.RSL: this is the results file that has formulae programmed in to calculate the TPA data from the measurements. Unless this particular results spreadsheet is open when the TPA Macro is run, the TPA parameters will not be calculated in the spreadsheet columns as expected.